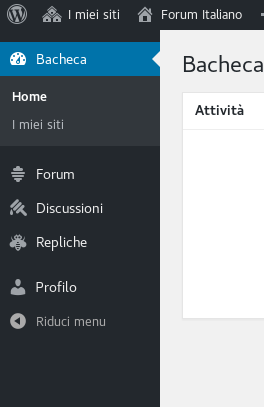 management that was in the left sidebar of the forum backend. I hope someone could fix it ASAP, please tell me if I can help to solve the issue. bbPress Keymasters don't get access to users. For that access, you need to be an Administrator of the WordPress site. Whether you need that access or not is a good question that should be resolved by discussion in slack, but it's not a bug, so I'm going to close this ticket. Re-opening so I can investigate this. Keymasters for local forums should have more access. @ocean90 that's the point: how can we manage moderators? I mean, a Keymaster could have more permission of a moderator, isn't it right? And before few weeks ago I had this permission. Fixed in [dotorg12611] (Use the 'user_has_cap' filter to work around an (unidentified) issue with the 'bbp_get_caps_for_role' action).